Yardangs 1. Photo courtesy of Michael Welland. Cross-posted at Through the Sandglass. An elongated erosional landform, commonly found in deserts, resembling the hull of an inverted boat. Similar to sand dunes, yardangs typically have a tall, steep side facing the prevailing wind direction and slope gently down away from the wind. 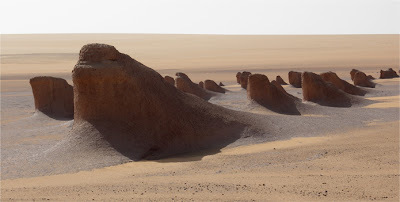 Yardangs are formed when looser material is eroded away (primarily by the wind and particle abrasion), leaving behind more consolidated material that is then sculpted into strange, ship-like shapes by further erosion. Yardangs most commonly form in soft rocks such as siltstone and sandstone (rocks commonly found in deserts) but can also form in harder rocks in places where the wind is the primary erosional force. The word yardang is of Turkish origin coming from the word “yar” which means “steep bank or precipice.” According to the Oxford English Dictionary, the word yardang was first introduced to the English language in 1904 by the Swedish explorer Sven Anders Hendin. I had actually never heard of the word “yardang” until quite recently. Earlier this year I wrote to Michael Welland, author of the book Sand: The Never-ending Story and the Through the Sandglass blog, and asked him if he had any pictures of nabkhas for my “N is for Nabkha” word of the week. Michael wrote back promptly and sent me a beautiful picture of some nabkhas in Namibia. He also told me that he had some great yardang pictures for when I reached the letter Y. Well, I’ve finally reached the letter Y, and Michael has been kind enough to send me some pictures of yardangs and also some musings on these strange desert landforms. Both the pictures and the musings are below. Thanks so much, Michael! Yardangs 2. Photo courtesy of Michael Welland. Yardangs 3. Photo courtesy of Michael Welland. Click to enlarge. Yardangs 4. Photo Courtesy of Michael Welland. Click to enlarge. They cluster together in a slight depression in the landscape, in all likelihood an old lake bed in which their clay and siltstone were deposited. The lake dried up as the climate changed, bringing with it the desert, the sand, and the wind. And the sand and the wind conspired as a great sculptor, sand-blasting the softest sediment, liberating the rough forms of the harder rock. The abrasional power of the sand is greatest within a meter or so of the ground, the height of flying grains in a sandstorm limited by the physics that Ralph Bagnold set out. And the sculpting takes place in the face of the prevailing wind, the face of the rock heading into the wind receiving the fiercest blasting, eddies and the slipstream chipping away in its lee. So these things explain some of the forms of the yardangs – the front face undercut to the maximum height of the strongest sandblast, leaving the “head” above. The result is, of course, reminiscent of the Great Sphinx, and romantic speculators like to think of yardangs as the inspiration for the iconic monument. Just as the Sphinx was for so long draped and buried in the sand, so the yardangs are draped in the debris of their deterioration, and drifts of sand pile up against their flanks. But they are simply the inevitable result of aeolian processes – they are all facing the same way because they are facing into the prevailing wind, their shapes are determined by the interplay between the physics of flying sand and the varying resistance of the rocks that are in its way. So far, so good – but think about them some more, and yardangs have their mysteries. Why are they spaced out the way they are? Some intrinsic depositional variation in the old lake sediments? Or is there some feedback going on here, one yardang influencing the flow of the wind so as to preclude another one developing within some critical distance? And, while I talked blithely about “eddies and the slipstream” chipping away in the lee of the front face, what does this actually mean? Why is the slope and curve of their “backs” so remarkably uniform? I don’t know that we know the answers to such questions – which is why there is an intrinsic geo-weirdness to them. But, regardless of any geo-weirdness, a herd of yardangs is simply weird in its own right, making for a distinctly weird landscape. And you just can’t not think of them as a herd. As we walked away, I could have sworn some of them were watching us.